According to the Alzheimer’s Association, “Alzheimer’s disease is the sixth-leading cause of death in the United States and the only cause of death among the top 10 in the United States that cannot be prevented, cured or even slowed.” My grandfather was diagnosed with dementia in 1995. At that time an official diagnosis of Alzheimer’s was suspected, but could not be confirmed without an autopsy. He lived with it until he passed away in 2001. Alzheimer’s is a disease that robs us of those we love with one forgotten memory, one confusing conversation, and one altered personality trait at a time. What begins as a frightening odyssey for the sufferer becomes an all-encompassing journey through grief for the caregiver. My grandfather was a proud, hard-working man who had his own tile business and also worked with his brother in a separate masonry business. In his youth, he was an avid soccer player and regaled us with stories of being the goalie in numerous games. He and my grandmother raised their children in a three-family house they bought for cash in 1951. Grandpa often spoke of the benefit of having extra income each month from the two apartments he rented out. Grandpa dressed in his suit and tie every day. As he grew older, he would fill those suit pockets with egg cookies that he would share with our dogs. He always had Lifesavers for the grandchildren, usually cherry or tropical fruit flavored. He was full of life and laughter. My grandfather was the ultimate family man, devoted to his wife, children, and grandchildren. My grandmother was the rock that formed his foundation. She stood by his side and protected his dignity until her last moments. We didn’t realize how much of his progressing memory issues she hid until she passed away, and we all stepped in to help care for him. She carried the weight of caregiver in silence, never asking for help, or even hinting that something was off. After my grandmother passed away, things with grandpa declined quickly. We traveled the unfamiliar territory of Alzheimer’s as a family, and our collective hearts broke as we witnessed a steady decline and the slow loss of the patriarch of our family. Our experiences were those common to anyone with a loved one stricken by the terrible disease. 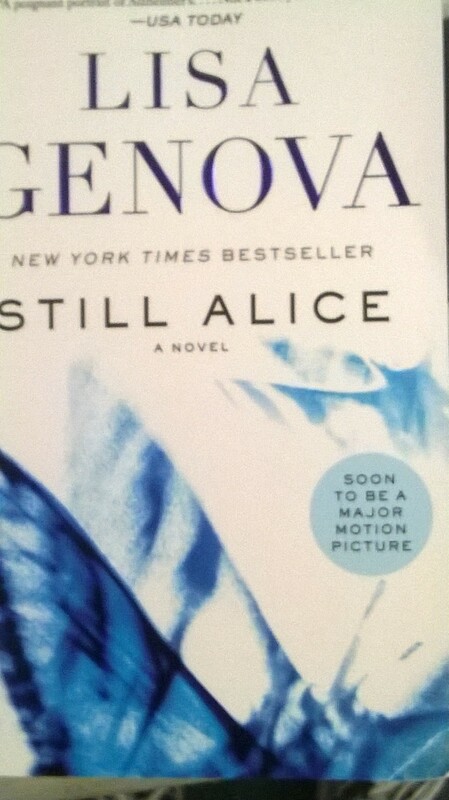 One of the best books I’ve ever read on this topic is Still Alice, by Lisa Genova. It is a fictional account of a Harvard professor diagnosed with early-onset Alzheimer’s. As a reader, you experience the course of the disease, first as partner with Alice, and later as partner with her husband and daughters. The terror of knowing something is vaguely wrong rapidly progresses to diagnosis and decline. Although depressing, the moments of small victories and touching family moments bolster your spirits, if only for a brief time. It was a book that hooked me from the first page. I picked it up one morning and did not put it down until I finished it several hours later. If you are looking for information, or even shared experience through a terrible time, I highly recommend this book. For further information, or to make a donation, please check out the Alzheimer’s Association page Join the Cause. Previous Previous post: Isn’t It Ironic?